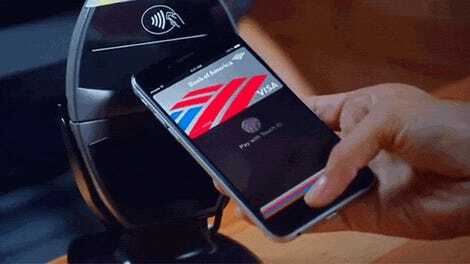 Mobile payments are the future, so we’re told. Apple, Google, and Android all want you surviving on nothing but their products—your financial data safely stored on an NFC chip inside. While not every store in the US supports it, most of them do. Same with the banks. We’ve run though everything, from which banks and stores support smartphone pay to which app to use. So read on so you can stop reaching for your wallet every time you want a coffee. Before you can pay for something with your phone, you need to connect it to a real bank account with some real money inside it, otherwise waving your handset across a terminal isn’t going to work at all. The list of US and Canada banks supporting Apple Pay is now a lengthy one: By our reckoning the count goes into the thousands, from 121 Financial Credit Union to Zions First National Bank. Having launched back in October 2014, Apple has had time to get the major banks on board, and most are now signed up. For Android Pay in the US and Canada, the list starts with 1880 Bank and ends with Zions Bank, and while there are hundreds of banks signed up, the list isn’t quite as comprehensive as Apple Pay’s (which did have 12 months’ head start). While Apple might win in terms of sheer numbers, you’re still going to have to go a long way to find a bank that doesn’t now support Android Pay. Samsung Pay’s list of supported banks is shorter still (it launched in September 2015 in the US) but it’s still comprehensive: Chase, Bank of America, Wells Fargo, Citi, and more are all supported. The bottom line is that if you can’t pay with your mobile in a store, then a lack of support from your bank is unlikely to be the problem. This is where the big problem lies. You may have happily hooked up your bank cards to your mobile payment service of choice, but is it actually going to work when you get inside a store and offer up your smartphone in place of a debit card? Apple Pay, Android Pay, and Samsung Pay all work via the magic of NFC or Near Field Communication, short-range radio waves that allow the exchange of data between two devices, in this case a verified ID tag that says who you are and how you’d like to pay. Your card and bank details aren’t actually transferred when you tap your phone to the merchant kiosk. Instead, your phone sends a secured token representing those details (the tokens are issued by your bank when the card is set up for the first time). But in order for a merchant to accept tokens from your smartphone, it needs to have NFC-enabled readers installed. This is where Samsung Pay has the advantage over the services from Apple and Google. Besides working via NFC, it’s also compatible with MST or Magnetic Secure Transmission, the same technology that is in today’s credit and debit cards. It essentially enables your smartphone to mimic a card with a magnetic strip. In other words, just about any store that can swipe a card can accept Samsung Pay—you just hold your phone within an inch of the terminal. Again, tokenization is used so you don’t have to send over your payment information. But back to NFC, because if you have an iPhone or non-Samsung Android device then NFC is what you’ll need to pay with. Any shop where you see the contactless payments symbol (it looks like a wave of Wi-Fi hitting a hand) should accept payments via smartphone. If you see the Apple Pay, Android Pay, or Samsung Pay symbols (or all three) then even better. Where does it work? It would be an exaggeration to say smartphone payments work everywhere, but most major merchants now support the systems from Apple, Google and Samsung: Walgreens, McDonald’s, Whole Foods, Subway, Macy’s, GameStop, Staples, Starbucks, Best Buy, and the Disney Store are some of the outlets that will happily take a payment from your phone. Wal-Mart is noticably absent—having chosen to provide it’s own smartphone payment option via an app. You’re most likely to run into trouble in the smaller, independent places with older point-of-sale hardware (unless you’re using MST and Samsung Pay) but look for the contactless symbol to avoid any confusion. To answer the question we came in with: No, you can’t pay for everything with your smartphone yet, at least with Apple Pay and Android Pay. There just isn’t wide enough adoption by merchants. Unless you do all of your shopping at the big-name stores and know where you’re going to be spending each time, you’ll still need your cash and cards handy. It also depends on where in the world you live. The US, who is only now moving to chip and pin (EMV) credit cards, is behind many other nations. In the UK, where contactless debit and credit cards have been the standard for several years, just about every store has upgraded their terminals to accept these cards—and smartphone NFC payments work with exactly the same technology. From restaurants and bars to gas stations and malls, you’d be hard pushed to find somewhere in the UK that won’t let you pay with a phone. Do I need anything besides a phone to pay? To prevent someone from running off with your phone and having a spending spree, you need to verify your identity as you hold your phone on the payments terminal in any direction—this is usually done via a fingerprint on modern phones, but you can also unlock your phone before you pay with a PIN or pattern. Another security measure that’s in place is a maximum spend limit, though this varies between banks, cards, and merchants—for example, Apple says you “might” need to provide a signature or enter a PIN code for transactions over $50, so make of that what you will. Even if there’s an extra stage involved, it shouldn’t affect the convenience of paying with your smartphone. As we mentioned in the smartwatch comment above, you can make payments without a cellular or Wi-Fi connection, as the NFC chip handles the data transfer and the contactless terminal takes care of connecting to your bank to verify the transaction. Don’t be worried about paying with your smartphone if you’ve got no signal. 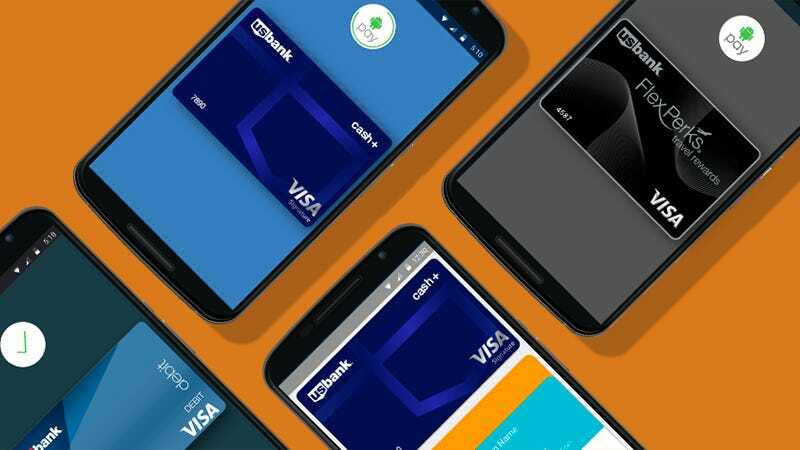 Setting up cards and accounts in Apple Pay, Android Pay, and Samsung Pay is pretty straightforward, although some details may vary depending on your bank and the security measures it’s put in place to prove you are who you say you are. You might need to verify your identity through a code sent to your registered mobile number, for example. On iOS, head to Wallet & Apple Pay from Settings, then select Add Credit or Debit Card and have your actual card handy to start the process. From the same menu you can set one of your cards as the default, to avoid any fiddling around at the checkout, and enable quick access to it with a double-tap on the Home button. If you’re using Android Pay, you need the Android Pay app from Google Play if it’s not preinstalled on your handset. You’ll be invited to set up a card as soon as you launch the app, and you can add extra ones via the plus button in the lower-right corner of the front screen—tap on an existing card to see recent payments and the token for it that’s been issued by your bank. Choose How to pay from the app menu to see exactly where the NFC chip is in your phone. Finally, to set up Samsung Pay, open the Samsung Pay app (which may already be on your phone), then choose your verification method of choice—you can even use iris detection if you want, if your phone supports it. The setup wizard guides you through the process of setting up your first card, and afterwards you can tap the Add button on the front screen if you need to set up additional cards.